Jersey GTL is a 2D side scroller by Medl Mobile, in which you control your little Guido to run as fast and as far as he can. So does Jersey GTL own the Jersey Boardwalk? Or does the little Guido get completely stepped all over? The game is set on the Jersey Boardwalk in which you control your little man to running across it as far as he can within the time limit but it’s not as simple as that. In your way are punks that want to stop you in your tracks so one touch and its game over. You run for so long, it gets dark! Another way to lose is by not keeping him tanned. This acts as your kind of health bar and throughout the game; you’ll see your Guido becoming paler and paler which means you need to find a tanning shop fast. These shops offer boosts and there are 3 different kinds. The Laundrette, Gym and Tanning shop. 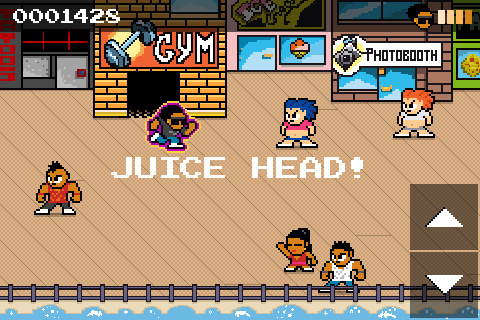 The Gym is where your little man can get Juiced up and become invincible for a limited amount of time. The Laundrette is where you can freshen up and get some clean clothes on and of course the Tanning shop is where you can get a tan and continue running for longer. Stay tanned, live longer... simple! Other ways to earn points is to woo the women that you come across or pick up items on the floor such as a chains, beer bottles or pizza slices. The most unique mechanic has to be the Tanning system in which becoming paler brings you closer to game over in turn revolutionising the traditional health bar and bringing things a step closer to realism. I like how the game becomes more difficult the longer you keep running, therefore the number of enemies on screen increase. I believe what could have been improved is if there was a way for the player to choose a speed they wished to start at instead of having to build it up every time. What I didn’t like about the enemies was that they just stood there and didn’t show any sort of movement whatsoever, even when collided into unlike the women who at the minimum where fist pumping before throwing kisses at you on collision. The game makes use of the 2D, retro look that suits both the game’s look and needs, however even so it uses the most simplistic form of this therefore it does make it seem to look pretty dry and nothing really stands out. 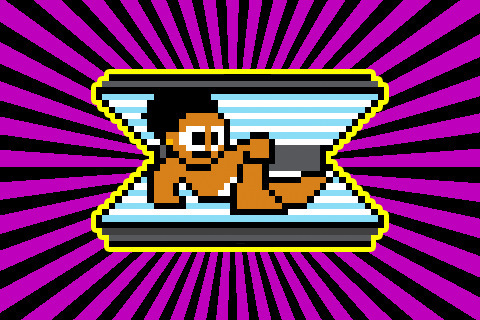 2D sprites are here to stay forever!! There’s really a simplistic air about the game’s mechanics and look which is good on the eyes and so anyone can just jump straight into it. Touch buttons are responsive and are given enough room and space to allow freedom of movement for the player without obstructing what’s going on the screen. 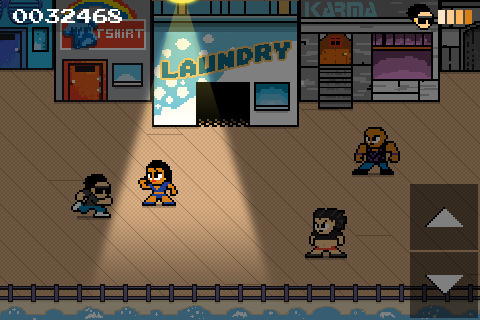 Jersey GTL is a simple yet addictive side scroller that keeps you coming back for more. The retro graphics adds a sense of nostalgia to the game and deepens its comedic atmosphere. The enemies are kind of still and lack any sort of life but it’s the game’s core mechanic to keep the little Guido alive that makes you not want to give up.